The Willow Run School Board looks on as Kristine Thomas, a district parent and previous board member, is sworn in as trustee on Thursday night. Thomas will take the position of Joi Jenson who resigned in early May. Kristine Thomas, a Willow Run district parent and previous board member, will take the spot of former trustee Joi Jenson, who resigned on May 6. Jenson originally re-applied for the position, but withdrew her application and the board did not consider her as a candidate. Thomas will hold the position until the election in November. Thomas served on the board previously for one year, and has lived in the Willow Run district since 1992. During her previous tenure on the board, Thomas took certification classes through the Michigan Association of School Boards, eventually earning a Level 2 Board Member Certification, which she said would serve her well in managing the district. Thomas said her main goals are to get up to speed on the issues at hand, including Willow Run’s woeful budget, which is more than $3 million in the red, as well as working with the community and helping the district to reorganize after retiring teachers and faculty are gone. The board, with Thomas newly sworn in, accepted the retirements of 11 teachers and staff members at the end of this school year and two more at the end of the 2011 school year. Thomas also said she intends to be fully informed on the closed session hearings underway against former district Superintendent Doris Hope-Jackson who faces more than 22 charges by the district that she violated her contract and misappropriated funds. “I need to make sure I have the background and the information I need, because I will not make a decision unless I have what I feel are all the facts,” she said. Five applicants vied for the trustee position, which was open to all residents in the Willow Run district over the age of 18. 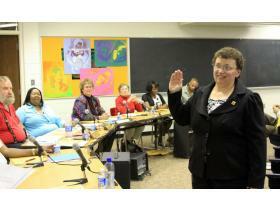 The board interviewed all the candidates during an open meeting at the district Thursday. Board President Sheri Washington said they chose Thomas because of her experience. In a previous interview with the Ypsilanti Citizen, Jenson said she resigned amid frustration with several issues the board was considering, including the countywide transportation consolidation plan and the implementation of a freshman academy at Willow Run High School. Jenson also said that she was having trouble communicating with other members of the board. It was unclear why Jenson withdrew her application for re-appointment to the board.